the two women who came to Jesus' tomb to anoint his body and were met by an angel telling them of his resurrection. The 24-foot-high window was created in 1928 by the Tiffany Studios of New York City. Like other Tiffany windows, it was made with the opalescent glass that Louis Comfort Tiffany developed and popularized under the name of "favrile glass." The window was given by Mr. and Mrs. George C. Willson as a memorial to his parents, Dr. James C. Willson and Rhoda Crapo Willson, whose names are inscribed at the base of two panels. First Presbyterian Church of Flint was organized in 1837, the same year that Michigan became a state. The present church building, designed by New York architect Lawrence B. Valk, was completed in 1885 to replace an earlier church home. An extensive remodeling of the sanctuary in 1928 provided for the installation of stained glass windows over the next several decades. 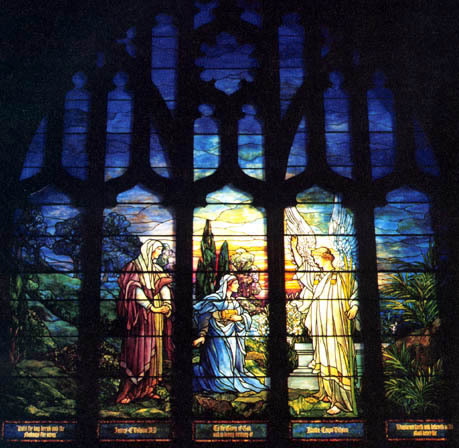 To view other windows made by the Tiffany Studios, visit the Windows of the Month for October 1998, July 1999, and October 1999. First Presbyterian Church of Flint was registered in the Michigan Stained Glass Census by Wilma Thoms of Clio. Text by Betty MacDowell, Michigan Stained Glass Census, April , 2000.